Christmas Cookies have been a holiday tradition for hundreds of years. In fact, modern day Christmas cookies can be traced back to recipes that were inspired by Medieval European biscuits which used modern ingredients like cinnamon, black pepper, ginger, nuts and dried fruit. In the 16th century, Christmas biscuits became popular in Europe. It wasn’t until the early 17th century that Christmas cookies were introduced to the United States by the Dutch, however. By the early 20th century, U.S. merchants began importing specially designed Christmas cookies for Americans to give to their loved ones as gifts. As early as the 1930s children in the United Stated and Canada have been leaving cookies and milk for Santa on Christmas Eve. Although there are various types of Christmas cookies that are popular with families during the holiday season, the people throughout the world often enjoy these 5 most popular Christmas cookies. Gingerbread cookies have been in existence since the soldiers brought sugar and cinnamon back to Europe from the crusades, but it wasn’t until Queen Victoria began incorporating them into her holiday celebrations that they became associated with Christmas. A holiday favorite, sugar cookies are often rolled and cut into festive holiday shapes and then either sprinkled with sugar or iced after baking. In the old days, Sugar cookies were sometimes used to decorate traditional Christmas trees. These magnificent cookies feature crushed walnuts and an abundance of powdered sugar that are certain to entice even the pickiest of cookie lovers. 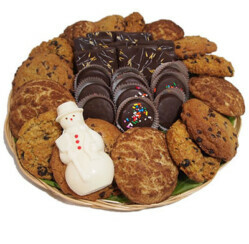 Not only are they simple to make, but they add an elegant touch to any cookie platter. These fantastic sandwich cookies offer a special jammy filling and a wonderful holiday cutout on top. They are a favorite choice for those you enjoy giving holiday cookies as gifts during the holidays. Made with anise, which is supposed to ward off evil spirits during the holidays, these cookies often fill display cases of bakeries throughout Italy. A colorful choice, they are often topped with colorful sprinkles to add a festive touch.